CHARM: 2019 Friendraiser & Mixer! Join us for a preview party celebrating CHARM: For your inspiration! This latest publication from CHARM: Voices of Baltimore Youth features poetry and prose inspired by famous authors. Your presence will support our free writing and publishing programs for Baltimore's young writers. There will be light fare, beer, wine, coffee & pastries + a Raffle of books from this years contributing authors & CHARM swag. Dress: Bookworm Chic; Come in your best book lover attire. Bring out your pair of readers, Your librarian gear or whatever your imagination illudes to when thinking Bookworm Chic. No Stress or Pressure come as you are. 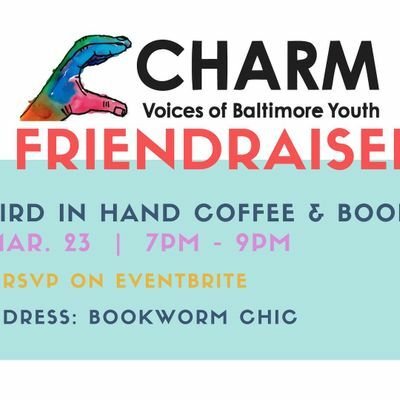 About CHARM: CHARM: Voices of Baltimore Youth is literary-arts organization founded on the belief that kids’ voices matter. Our mission is to help young people develop the skills of successful writers, cultivate a love of writing, and amplify their own voices. CHARM magazine was founded by a group of teachers and their students in 2013, and has since published six literary journals that feature the poetry, fiction, essays, and artwork of 450 students from more than 35 public schools in Baltimore City. CHARM magazine is produced by a dynamic student editorial board, which consists of 12-15 middle and high school students. We celebrate each volume’s publication with a launch event, where students share their pieces with each other, and celebrate their successes with community supporters. We now offer Young Writers Workshops—opportunities for youth to develop their writing skills through engaging, smallgroup sessions with local authors. In past workshops, D. Watkins guided students in crafting a memoir, Sheri Booker helped them write compelling dialogue, and Elissa Brent Weissman taught them how to “zoom in” on the small details that make a scene unfold. Our workshops invite students to learn how real writers approach their craft, as well as connect with peers from around the city who share their passion for the literary arts. 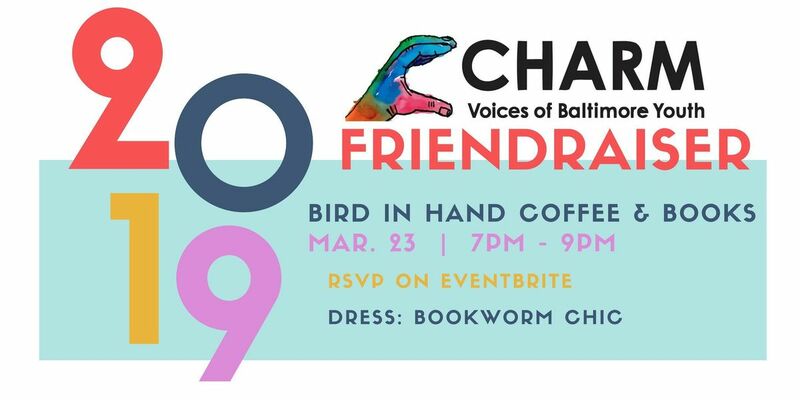 CHARM: 2019 Friendraiser &amp; Mixer!